• What will be the global Solar LED Street Lighting market value by 2024 along with the estimated CAGR? • What are the driving factors for the global Solar LED Street Lighting market through 2017 to 2024? • Which factors are impeding the growth of the global Solar LED Street Lighting market? • What are the recent trends and developments in the global Solar LED Street Lighting industry? • Which Global Solar LED Street Lighting type will lead the global Solar LED Street Lighting market by 2024? • What is the revenue generated by Solar LED Street Lighting (types) across different application verticals during the forecast period? • Which application will dominate the global Solar LED Street Lighting market by 2024? • Which region will lead the global Solar LED Street Lighting market by 2024? 7.2 Anhui Longvolt Energy Co., Ltd.
7.15 Su-Kam Power Systems Ltd.
7.18 Jiangsu Sokoyo Solar Lighting Co., Ltd.
Street lighting has been in existence even before electricity was first introduced. Prior to that, fire-based lamps were setup on the sides of the streets. There have been several developments in the street lighting, thus making it an efficient and inexpensive method of lighting. The global solar LED street lighting market is expected to grow at a CAGR of 16.5% in terms of volume and 13.2% in terms of value during the forecast period 2018-2024. The growth in the market can be attributed to the increasing demand of energy efficient lighting systems. The implementation of Internet of things (IoT) with lighting is also expected to increase the adoption of solar LED lighting, worldwide. One of major driving factors for the significant growth in the global solar LED street lighting market has been the rise in the energy consumption globally. The rising demand for electrical energy is affecting traditional lighting products as they are low energy efficient; hence, manufacturers and consumers are urged to switch to more energy-efficient products. Additionally, the current trends of energy consumption in the world suggest that in future, countries across the world will need to develop alternate sources of energy (renewable) to fulfill the growing energy demand, as the current oil prices are rising, and the reserves are depleting. Urbanization has resulted in increased consumption of electricity and CO2 emissions in the cities. With the advent of smart cities, the energy consumption is expected to reduce by a significant amount. Furthermore, the cost of the components used in the solar LED street lighting has been decreasing. The price of LEDs, batteries, and solar panels is decreasing. The governments of different countries have taken up initiatives to increase the usage of solar LED street lighting worldwide. This includes the solar LED street lighting to be enforced in different cities of various countries. However, the market consists of certain challenges, which inhibit the overall growth of the global solar LED street lighting market. The adoption of the solar LED street lighting is a very positive step toward enhancing the environment and also toward the conservation of the non-renewable fossil fuels. However, the market faces one issue standing in its way to be widely used throughout. The initial setup cost of the solar LED street lighting system, is very high in comparison with the cost of the traditional lighting setup. Companies also face a challenge in the market, as there is a competition due to the available counterfeit products. These counterfeit products imitate the original solar modules and are circulated throughout the market. Apart from that, the companies also need to keep a check on all the new products available in the market and also if any counterfeit products are being sold in the market. The evolving market trends and technological developments provide major opportunities for the global solar LED street lighting market. The innovations in the market help in boosting up the usage of the solar LED street lighting systems. These innovations include the introduction of new technologies, such as Internet of Things (IoT) and connected lighting. The growth of connected appliances and internet of things (IoT) offers smart lighting solutions which have started to penetrate the solar LED street lighting market. The only challenge faced in the adoption of solar LED street lighting is the high initial cost. This can be easily overcome by the adoption of the “as a service” model for the solar lighting industry. The Solar-as-a-Service (SaaS) gives the homeowners a low-cost option with a variety of benefits which last till the service agreement duration. The solar LED street lighting solutions are widely used in residential, commercial and industrial applications. Of all the applications for solar LED street lighting solutions, it is expected that the commercial application would dominate the market throughout the forecast period 2018-2024, growing at a CAGR of 14.7%. The increasing demand for solar street lighting across areas such as pathways, subways, public area lighting, and parking lots, among others are driving the demand for the commercial application. Geographically, APAC led the global HCL market in 2017 in terms of volume and value and the region is expected to witness the highest growth during the forecast period (2018-2024). APAC region is expected to dominate the market throughout the forecast period 2018-2024 and grow at a CAGR of 11.9%. Rising environmental concerns are expected to drive the growth of the APAC region for the global solar LED street lighting market. RoW region is expected to grow at the highest CAGR of 14.2% during the forecast period with the rising consumer awareness campaigns and subsidies provided by the government to boost the solar LED street lighting market across the Middle East and Africa. In the past three years, the global solar LED street lighting market has witnessed several strategic and technological developments undertaken by the different market players to attain their respective market shares in this emerging domain. Some of the strategies that have been adopted by the solar LED street lighting providers are expansions, new product launches, partnerships, collaborations, contracts and agreements, and mergers and acquisitions. Among all the strategies, partnerships and collaborations have dominated the competitive landscape to become the most widely adopted strategy by the solar LED street lighting system providers. 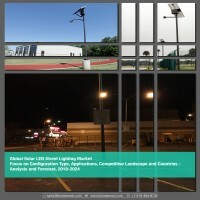 The key market players in the global solar LED street lighting market are Signify Holding and Anhui Longvolt Energy Co., Ltd, Solar Electric Power Company, Su-Kam Power Systems Ltd., BISOL Group, d.o.o., Greenshine New Energy, Solar Lighting International, Solar G, Orion Solar, Solex Energy Limited, Dragons Breath Solar, Sol Inc., Bridgelux, Inc., Sunna Design SA, and Covimed Solar.